DVD to Apple TV Suite for Mac is both a DVD to Apple TV converter for Mac and Apple TV video converter for Mac – a suite Apple TV conversion tool combined with DVD to Apple TV Converter for Mac and Apple TV Video Converter for Mac.It is a discount suite softeware to convert DVD and Video to Apple TV on Macs. This Apple TV suite is designed with many practical features and it lets you set video brightness, contrast, saturation, select DVD subtitle and audio track, trim DVD and video, and merge multiple files into one file and so on. A professional application developed only for Mac OS X users. Rip DVDs to Apple TV and convert videos to Apple TV video and Apple TV audio on Apple Mac OS X. Select any available subtitle and audio track on your DVD. Trim your DVD and video to output your favorite DVD and video clips only. Crop videos to remove black sides from your DVD or video files. Customize movie video effects by setting video brightness, contrast, saturation, and applying a special video effect. Merge and convert more than one DVD title (chapter) or video file in to one file. Preview your DVD and video files before conversion to adjust the output quality. Convert DVDs to Apple TV MP4 and convert videos to Apple TV MP4 with DVD to Apple TV Suite for Mac is just a breeze. 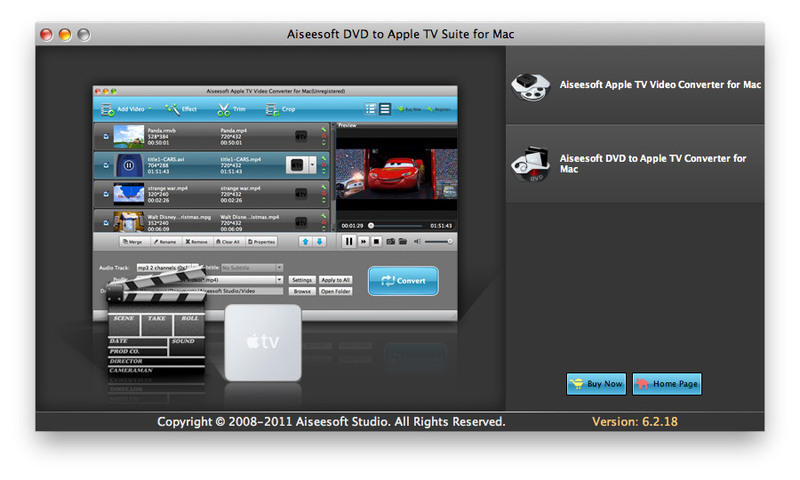 Why Choose DVD to Apple TV Suite for Mac?